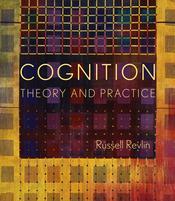 Cognition: Theory and Practice provides the link between theory, experimental findings, and ordinary human activity, showing students how the field of cognitive psychology relates to their everyday lives. Engagingly written, the book captivates students by explaining common experiences such as why answering a cell phone while driving is as dangerous as closing your eyes for a half-second, but talking with your passenger for a minute can be perfectly safe. Research coverage draws heavily on the rapidly accumulating discoveries of human neuroscience and brain imaging.